How to watch Hot Tub Time Machine (2010) on Netflix Brazil! Sorry, Hot Tub Time Machine is not available on Brazilian Netflix, but you can unlock it right now in Brazil and start watching! With a few simple steps you can change your Netflix region to a country like Egypt and start watching Egyptian Netflix, which includes Hot Tub Time Machine. We'll keep checking Netflix Brazil for Hot Tub Time Machine, and this page will be updated with any changes. 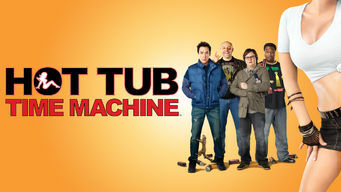 Hot Tub Time Machine is not available in Brazil BUT it can be unlocked and viewed! Fueled by energy drinks, vodka and nostalgia for their younger, wilder days, a group of aging best friends travels back in time to 1986. What happens when a hot tub goes rogue? You might wind up reliving the '80s. Better not change history! There is a way to watch Hot Tub Time Machine in Brazil, even though it isn't currently available on Netflix locally. What you need is a system that lets you change your Netflix country. With a few simple steps you can be watching Hot Tub Time Machine and thousands of other titles! Watch "Hot Tub Time Machine"